The City of Pella offers a variety of youth and adult recreation programs. See the programs listed below for details. Use the hyperlinks to access registration information. For more information please contact the Community Services Office at 641.628.4571. The City offers a recreation Youth Flag Football program for youths in grades 3-6. The program will be instructed as a non-contact activity and is based on the child's participation, not performance. The season typically runs mid August through mid October. Practices and games will be held on Mondays, Tuesdays, Thursdays or Fridays. The City also offers a Little Tyke Flag Football program for youths in grades 1 and 2. This program will include fundamentals, basic rules, and short scrimmages. This program is typically held on four Saturdays in October and November. The City offers recreation Youth Soccer for Kindergarten through 8th grade in the fall. Each team practices one night per week for one hour on Monday, Tuesdays, or Thursday evenings. Games are held on Saturdays. Field layout map. The City also offers a Little Tyke Soccer program for preschoolers in the spring. Due to the closure of the Community Center Gym, all City run basketball programs are cancelled. Here are other basketball programs offered in Pella. The City's Mens Slow-Pitch Softball league's season runs from early May through June with a tournament at the culmination of the season. All games will be played at the Sports Park. The City's Adult Co-Ed Softball league's season runs from early July through August with a tournament at the culmination of the season. All games will be played at the Sports Park. Are you interested in athletics? Are you looking for a great way to serve your community? Consider volunteering to be a coach for one of the City's recreational programs! 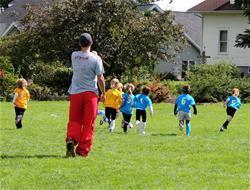 Coaches are needed for the Youth Soccer, Youth Flag Football and Youth Basketball. A background check is required and training will be provided. Complete the background check form and return to the Community Services Office.